Shacharit minyan services are held in our tranquil Kiddush Room overlooking the Biblical Garden every morning except Shabbat (Monday through Friday at 7:30 am and on Sundays and statutory holidays at 8:30 am). Minyan enables you to begin your day with stillness and community at any time, and it provides a comforting support in times of loss. Light breakfast is served. Erev Shabbat services are held at 8:00 pm in our peaceful main sanctuary. They are an uplifting way to welcome Shabbat, with sermons or talks that are enlightening and thought-provoking. Our magnificent volunteer choir joins us regularly, elevating our prayer through classical Reform, contemporary, Sephardic and Chassidic music. Kabbalat Shabbat services are held at 6:00 pm in our Kiddush Room. They are an inspirational, warm and spirited way to greet Shabbat with your family before returning home for your Shabbat dinner. Music is engaging and participatory, accompanied by guitar and occasionally a drum. Family Shabbat services and dinner (6:00 pm) are held regularly throughout the year, co-led by David Gershon of the duo, Judy & David. The service and storytelling are designed to engage young children, together with their parents and grandparents. Extended family and friends are most welcome; pre-registration is required for dinner. Shabbat morning services are held at 10:30 am in our main sanctuary. Our services are informal and participatory. All Torah chanting and honours are led by congregants. 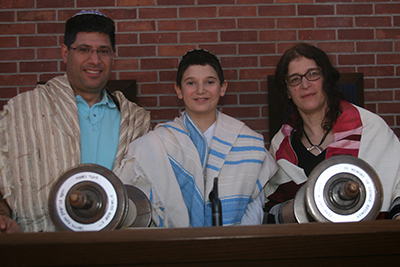 B’nei Mitzvah are welcomed into our congregation as part of Shabbat morning services in a welcoming, celebratory, and personal service that is enjoyed by our regular congregation and our visitors alike.